David Milne, Professor of Music at the University of Wisconsin-River Falls, teaches saxophone/woodwinds, jazz studies, and directs and produces the university’s jazz series. Based in Minneapolis/St. Paul, Minnesota, David performs in diverse settings as a saxophonist and multi-woodwind instrumentalist, ranging from creative jazz, modern big band, and progressive popular genres to chamber, orchestral, and contemporary classical genres. David leads One World Consort, a multi-genre chamber ensemble featuring traditional music from a broad range of world cultures and traditions. Originally from Rochester, New York, David received the diplomas D.M.A. Saxophone from the Eastman School of Music, M.M. Woodwinds from Indiana University, and B.A. Music from Indiana University. 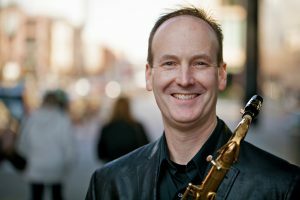 Active internationally as a soloist, guest artist, and educator/clinician, David is an artist-clinician for Selmer Paris Saxophones and Vandoren Woodwind Products.